One of the new features of the Nokia N810 is it’s micro-USB OTG A/B connector. If you’re not familiar with USB OTG, it stands for “On The Go”. It’s a new USB standard which is supposed to do away with all of the proprietary mini-USB connectors out there. Essentially, it’s a way for USB connectors to determine whether they are in host or slave mode by the type of connector that’s plugged in. However, as with all new tech, there’s not a lot of penetration as of yet. That means there are a few OTG B connectors (slave connectors), but very few A’s, which allow the n810 to function as a host. So I built this little dongle myself. I bought a USB OTG cable from Amazon. 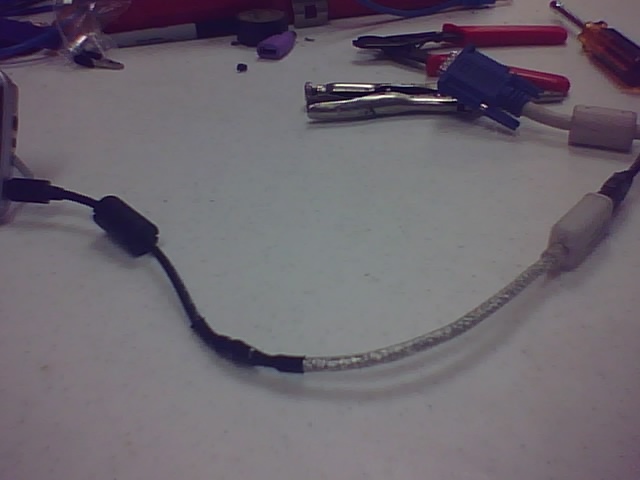 This one right here, in fact: USB micro-A cable. However, as you can see, it has one problem…a male A connector. Now, I’m not sure why this cable is being produced. According to the OTG specs, the micro-A connector is for host-mode operation. Since usually the male A connector is ALSO used for host-mode operation, the effort really seems futile. Anyway, so I took a USB extension (a Male-A to Female-A cable), and cut the female end off, then spliced it onto the micro-A end of the OTG cable. Voila! Instant OTG host-mode goodness. In fact, I’m writing this using a standard USB keyboard, with my n810. Works awesomely…if I could stop misspelling things.